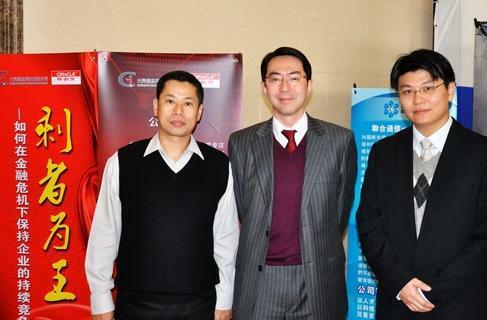 News - 2009年12月CITS剩者为王研讨会 - Dongguan ERP | Dongguan Oracle | Dongguan CRM | Oracle ERP - 东莞最强最有实力的Oracle认可顾问公司 - CITS - COSMOS i-TECH SOLUTIOINS LIMITED. Cosmos i-Tech Solutions Limited (CITS) kicked off a seminar themed “Survivors are winners: How to sustain the competitiveness of an enterprise in financial crisis” at Dongguan Exhibition International Hotel on 2 December 2009. Being the first event of its kind hosted by CITS, the seminar was well-attended by dozens of existing and prospective clients. Renowned software specialists from Oracle Systems Hong Kong Limited (Oracle), a business partner of CITS, were invited to the seminar and be the guest speakers. The seminar aimed to offer insights into how enterprises, amid the economic downturn, can turn crisis into business opportunities and deal with losses light-heartedly. It is crucial that enterprises are able to adopt a rational approach by implementing an appropriate resources planning strategy in order to weather the economic storm and yield more revenue. The seminar was started off with welcome remarks presented by Sales Director, Applications Mr. Rudolf Ho from Oracle. Next up was the keynote speech from Principal Solutions Consultant, SCM Applications, Greater China Mr. Frank Tang from Oracle. The experts examined with participants the thoughts on implementing an ERP system for enterprises of advanced technology, and shared their opinions and suggestions on the ERP and CRM systems developed by the leading software company. Based on the e-business suite of Oracle and coupled with real-life cases of ERP implementation, Senior Application Consultant Mr. Hou Xue Ya from CITS illustrated how enterprises could make use of the state-of-the-art resources planning technology and service to think big and go strong in achieving their strategic objectives in the course of optimization, operational improvement, and innovation. Chief Executive Officer Mr. Anthony Chung (left), Deputy General Manager Mr. Pliny Lo (right) from CITS, and Sales Director, Applications Mr. Rudolf Ho (middle) from Oracle pictured together at the seminar.